The TL Sub 30 is suited for an extremely detailed reproduction of lowest bass in the subsonic range. This subwoofer is something for those who are prepared to sacrifice half a cubic metre of living room or are planing to build a new wall unit. What has to be mentioned before hand, however: the bass of the lowest octave is certainly not a disco bass that hits your stomach, but is very soft. The bass becomes noticeable by an air pressure fluctuation, where the source cannot be located, and lets the trouser leg flutter. The ultra low bass give a fascinating live impression - provided they are really on the recording. On request all Visaton subs are supplied with compensating magnet for speaker placement close to a CRT. The magnet of the bass driver is so strong that a minimum distance of 1 metre has to be kept to the CRT. 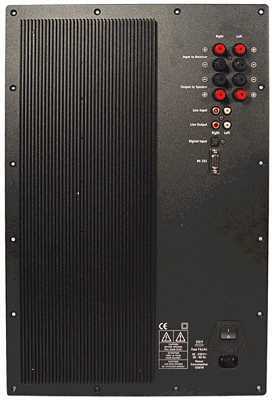 The TL Sub 30 is available with different amplifiers, depending on requirements. The combination with the Sitronik VP 500 A (pictured right) make sense when reliability is important. All subwoofer modules available have two internal connectors for the driver and high level inputs outside to connect the module to the loudspeaker output of your amp together with your existing speakers. Additionally, all modules have RCA inputs for connection of a video play back unit or the pre-out of your amp. If you prefer amplifier modules by other manufacturers, like Inosic no problem. Just give us a call.